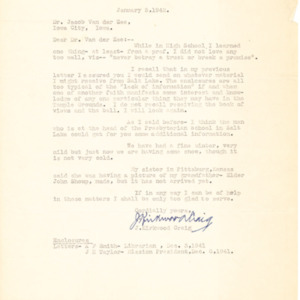 Letter from J. Kirkwood Craig to Jacob Van der Zee, which accompanied a photography of John Shoup. 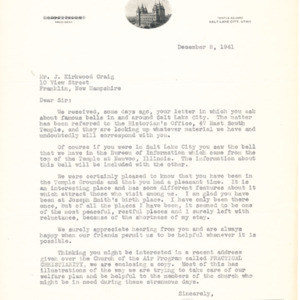 Letter from J. Kirkwood Craig to Jacob Van der Zee, which he sent along with letters from John Taylor and Alvin Smith from Salt Lake City. 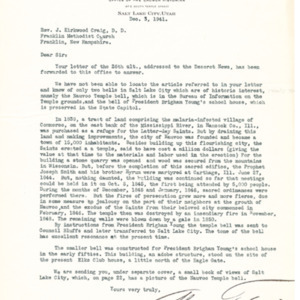 Letter from John H. Taylor to J. Kirkwood Craig, related to Craig's search for information about the Church's missing bell. John Taylor was the President of the Temple Square Mission in Salt Lake City. 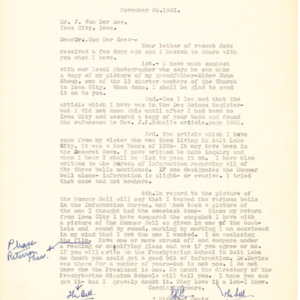 Letter from J. Kirkwood Craig to Jacob Van der Zee, detailing some of Craig's efforts to find and identify the missing Church bell. 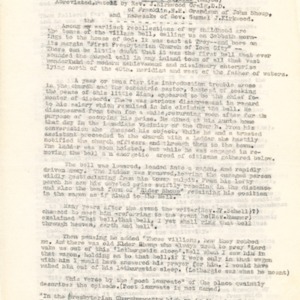 Jacob Van der Zee was wrote many historical items, including a History of Presbyterianism in Iowa City. 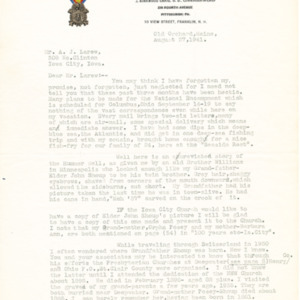 Letter from J. Kirkwood Craig to A.J. Larew. Craig mentions that he is sending his recollections of the missing Church bell, and also speaks about his grandfather, John Shoup. A re-telling of Craig Schell's account of the Church's missing bell, by J. Kirkwood Craig. 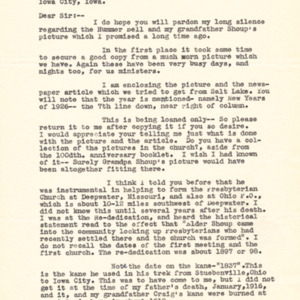 Schell's account was from 1911, and Craig is giving an abbreviated version of it in 1941, and adds his own recollections and information to the story.